The Oldershaw family have been farming for three generations and look set to continue for at least another three. They've seen the rise of shallots from the preserve of chefs, to the store cupboard staple they are today. It was quite a different story though when Gilbert Oldershaw (MBE) began farming with his brother in 1946 in South Lincolnshire. They grew onions, garlic and some shallots. Starting small, they took some risks and saw demand dramatically increase. Gilbert’s son, Robert, joined the business and he too soon became an expert grower. Today the growing is his responsibility. This expertise is essential as shallots need a lot of care and attention to grow. For example sowing the exact amount of seeds in a bed is crucial. Too many plants will mean the shallots will be too small, too few plants and the shallots will be too big. Size does matter. While they can be quite high maintenance to grow, fortunately shallots have almost magical storing qualities. These are further enhanced by the curing process. The Oldershaw brothers, having grown onions and tried out a new approach to curing, decided to try this method with shallots. It was highly successful and it wasn’t long before Oldershaws of Moulton were upheld as leaders in their field. Soon enough, Moulton Bulb Co Ltd – the packing and processing operation began, with Gilbert’s grandson, Robert at the helm. Robert, 37, studied Food Marketing and Management at Sheffield. And, not surprisingly the innovation continues apace. 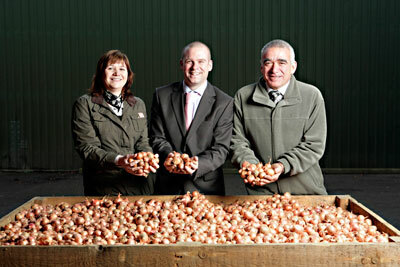 “We’ve always been a business to jump in and give it a go,” says Robert Oldershaw (Jnr) who is a director of both Moulton Bulb and Oldershaws of Moulton Ltd, the growing side of the business. .
Sara Woodrow, Gilbert’s granddaughter, also works in the business. Sara, is 33 and mother of three, began her career in HR and then changed direction. “I never really wanted to be in an office so when an opportunity emerged to be Assistant Farm Manager, I jumped at the opportunity to be outside, work with my Dad and get my hands dirty.” She’s now got her hands full with her family – but if history is anything to go by – these will be tomorrow’s shallot growers!